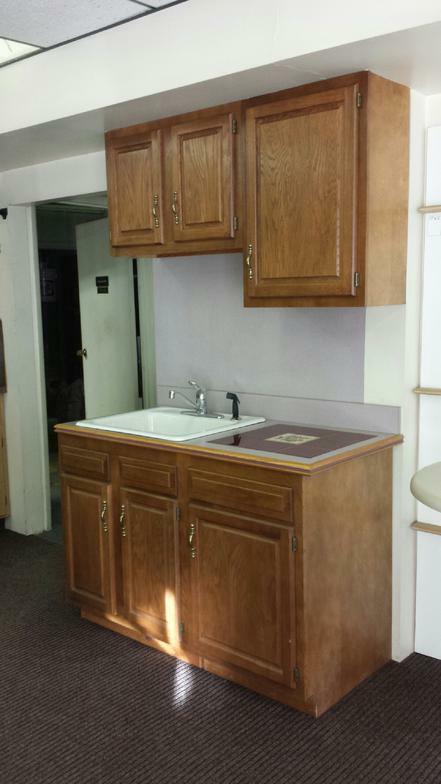 This is a golden oak kitchen display for sale. 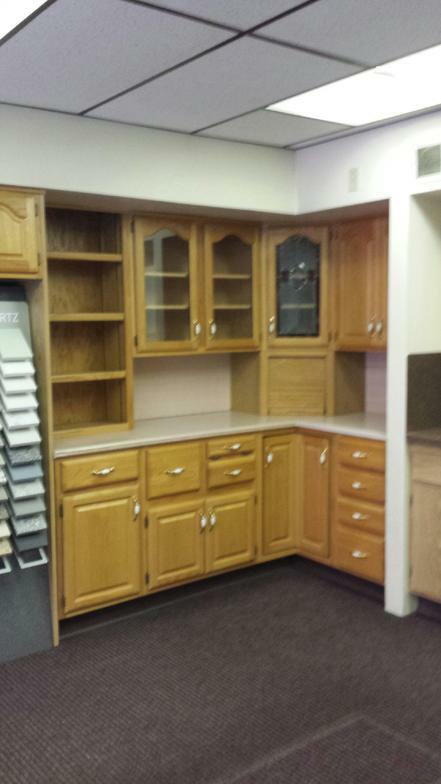 The wall cabinets are standard depth with clear glass and stained doors. There is a 24 inch corner tambour garage and open shelf unit included. The base cabinets are standard depth of 24 inches with one specialty Containing a bread drawer, cutting board, and pull out shelf unit at the bottom. The corner base unit is a two-tier Lazy Susan. In the corner is a four drawer unit. The countertop you see in this picture does not come with this display. We will build a custom counter with stock laminate at no additional cost for you.There is also a matching island base unit listed separately with a granite countertop.if interested in any of these displays, please feel free to contact us through our website. 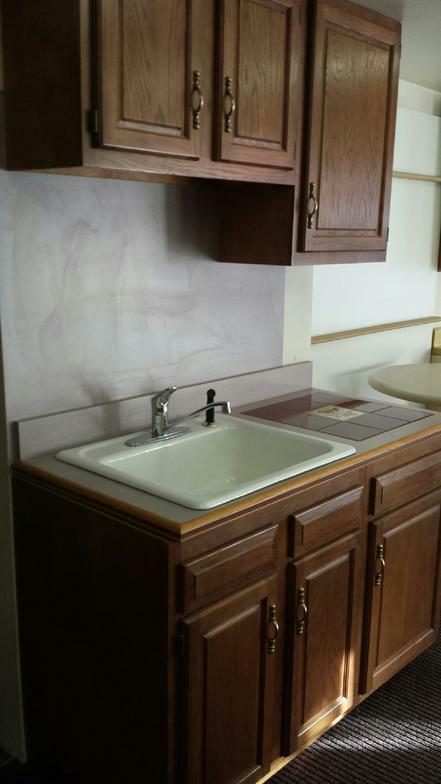 This display unit is a dark oak raised panel door sink base display. 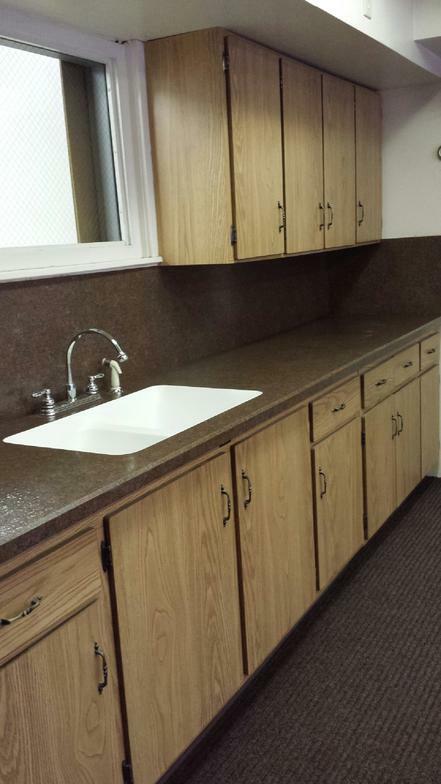 This display measures 51 inches in length comprised of a 30 inch sink base and 21 inch drawer base. 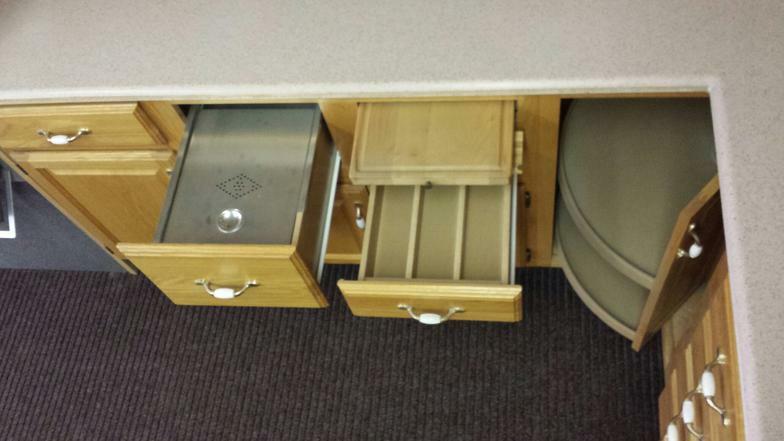 The drawer base contains a garbage attatched to the door. 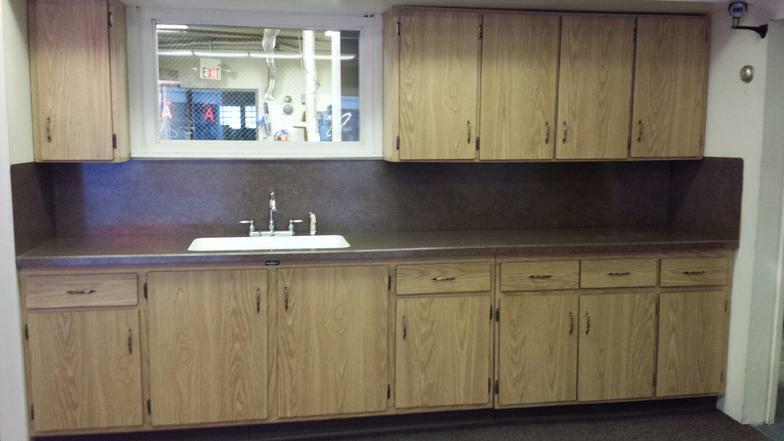 This display is being sold with a Formica countertop and features a golden oak inlaid edge for an edge treatment. 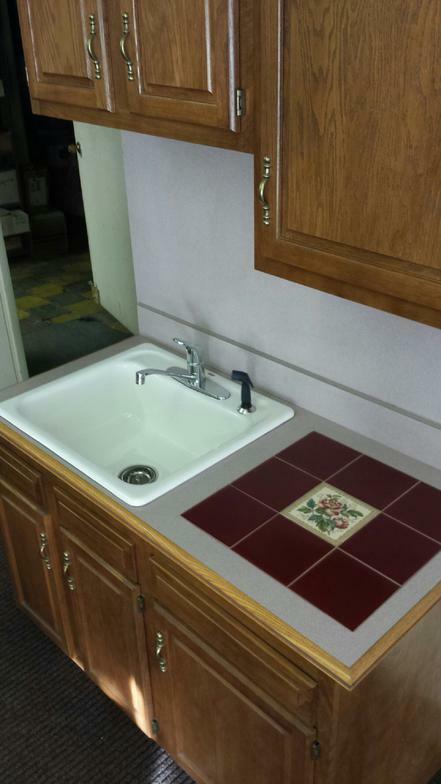 There is also a built in tile cutting board inlaid into the Formica.Included is a single bowl Elger sink and Delta faucet with spray. This display also includes two wall cabinets that are 51 inches in length comprised of a 30 inch wide X 21 inch high over the sink and 21 inch wide X 30 inch high over the cutting board. From the left side of the sink has a 15 inch center. Please contact us for any further questions. 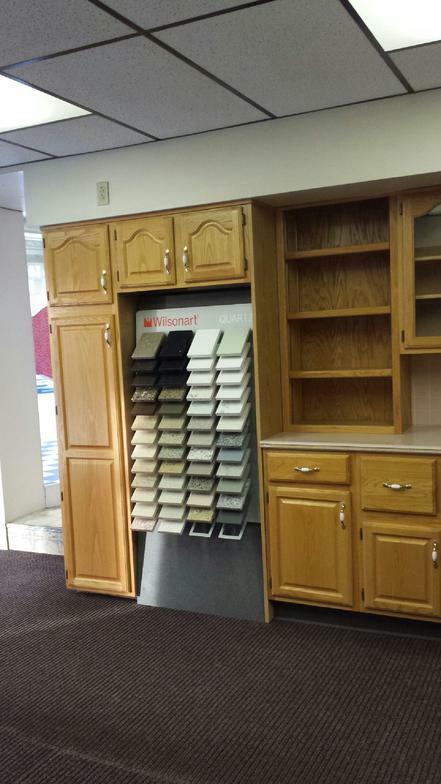 This display is comprised of custom-built cabinets that are built with T- molding edges on a flat formica door style. The total length is 133 inches of base cabinets. 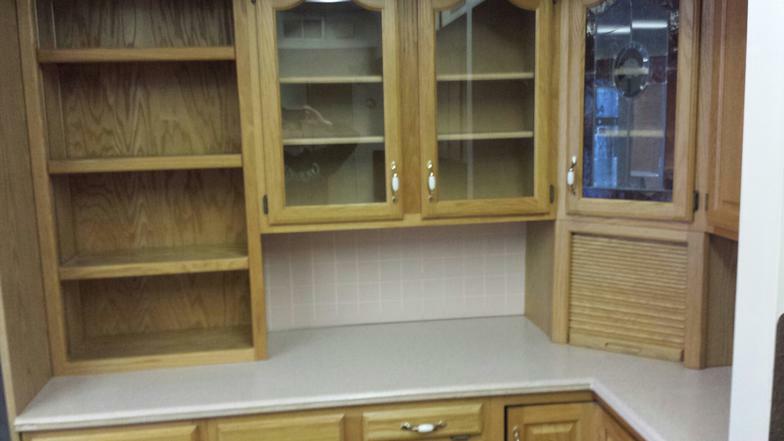 The wall cabinets are 30 inches high by a 15 inch wide cabinet on the left and a 67 1/2 inch wide cabinet on the right. The countertop is a bevel edge Wilsonart selection called Mountain Massage 1843K-45 which is a color that is still available. This is a high definition granite color with a under mount Karran double bowl sink. Also included is a gooseneck Delta faucet with spray. Please feel free to contact us with any further questions on this display unit. 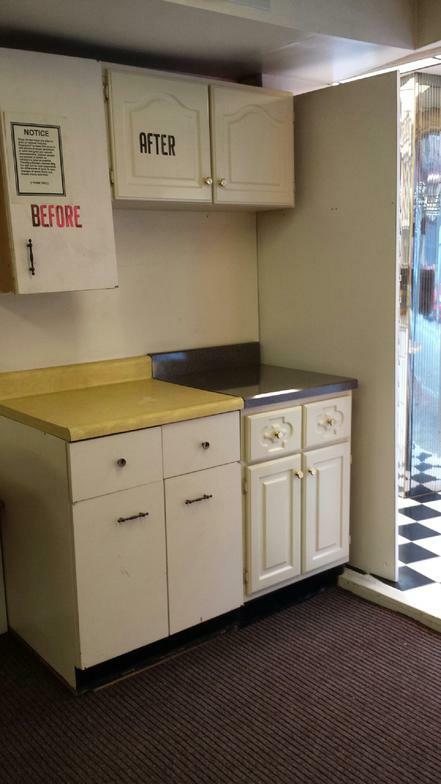 This display unit was used as an example to demonstrate the changes that take place during a kitchen reface. 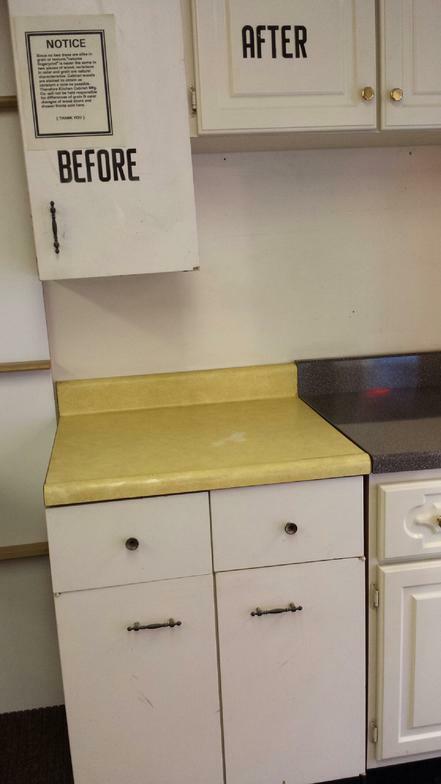 The kitchen cabinets in this picture are used from an older kitchen. The left side demonstrates what the original kitchen looked like and the right side has been replaced with a thermal foil doors with new hardware. The base cabinet on the right measures 24 inches and the wall cabinet is 36 inches wide by 18 inches high. 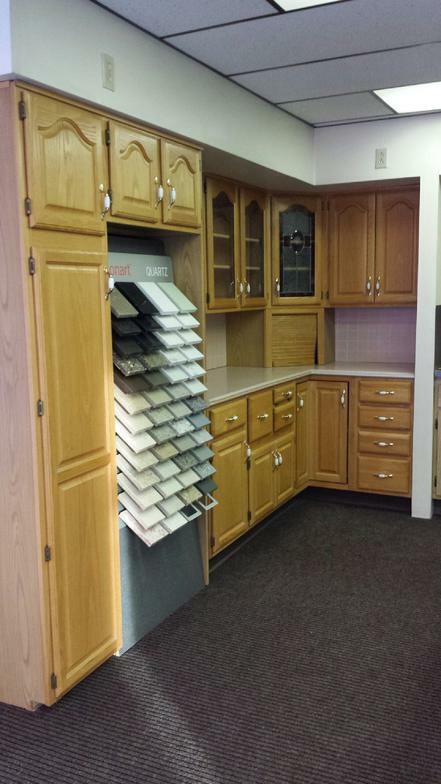 The cabinet on the left has a 27 inch base cabinet with a 15 inch wide by 30 inch high wall cabinet. 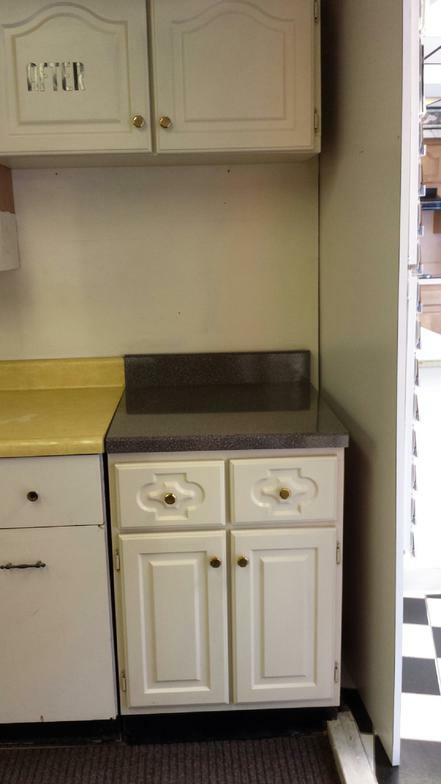 The countertop on the right is a high gloss granite beveled edge counter and the countertop on the left that shows quite a bit of wear is a older post form style. Any further questions on this display, please feel free to contact us.